Compost Lasagna - Kauai Seascapes Nursery, Inc.
We all know that compost is a great way to add organic matter and fertility to the soil, and it’s a great way to utilize food scraps and green waste! There is still energy and vitality in those “waste” materials, which can be converted into a rich dark compost that will nourish plants and break up hard clay soils. That being said, maintaining a compost pile properly takes a little bit more planning and work than simply throwing food scraps in a pile. There is a balance between carbon and nitrogen that must be achieved to create a good compost. The carbon sources or “browns” are often dried leaves, coconut husks, wood chip, small branches that have been cut up, even sawdust. The nitrogen sources or “greens” are food scraps, manure, fresh broken up green waste, coffee grounds, and grass clippings. 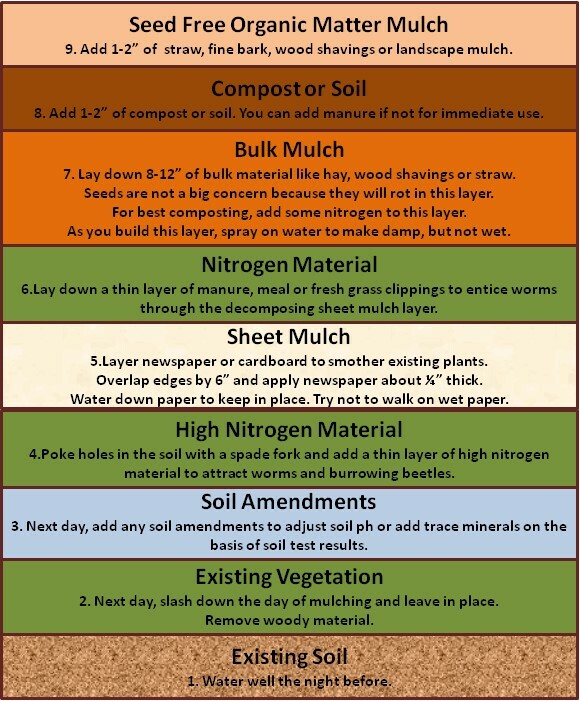 When creating compost using a traditional pile, you must keep in mind how much greens and browns are being added at any one time in order to maintain the happy ratio that allows the materials to truly breakdown into a nice compost. Another approach is to do it all at once, wait six months, and voila, you have an instant garden bed. This approach is called sheet mulching, or compost lasagna. This is a great way to create a contained compost area that won’t smell or have exposed food scraps. The main concept is layering everything on the ground in a way that works with the ideal carbon to nitrogen ratio, covering it all with cardboard and mulch, and keeping it moist for 4-6 months. The result is a garden bed full of organic matter that was relatively low energy and low input. Essentially, you set it and you forget it. The main drawbacks to this are time and material. When creating a sheet mulch bed, you must accept that you will have a pile of breaking down materials exposed for many months. Once it has fully broken down, it can be planted in, but prior to that, you wont really be able to hide it. Another limiting factor is the raw materials. If you want to create a decent sized bed, you will need a lot of green and brown waste all at once as well as other mineral inputs that may require some collection such as coffee grounds or egg shells. Because of the time and materials, this is a great approach for planning ahead and prepping an area for tree or shrub planting. You can create a series of piles of sheet mulch, and once enough time has passed, plant fruit trees into the sections. Because of the amount of materials needed at once, this is a great way to chip away at the project and create organic matter ahead of time in anticipation of planting trees. This graphic highlights how you would ideally layer all your source materials, and even a bit of a timeline as you how to make it all happen. Ideally, you are aiming for a 25:1 to 30:1 ratio of carbon to nitrogen. 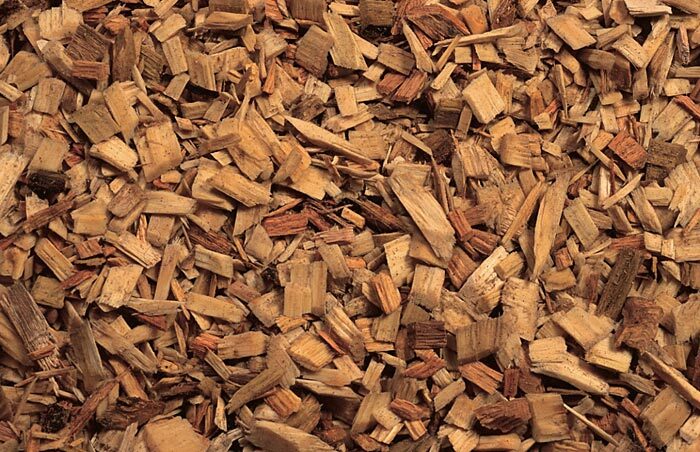 This means you will need a lot of bulk mulch materials such as coconut husks, or dried leaves. Dried palm fronds are also a great way to add layers of brown. 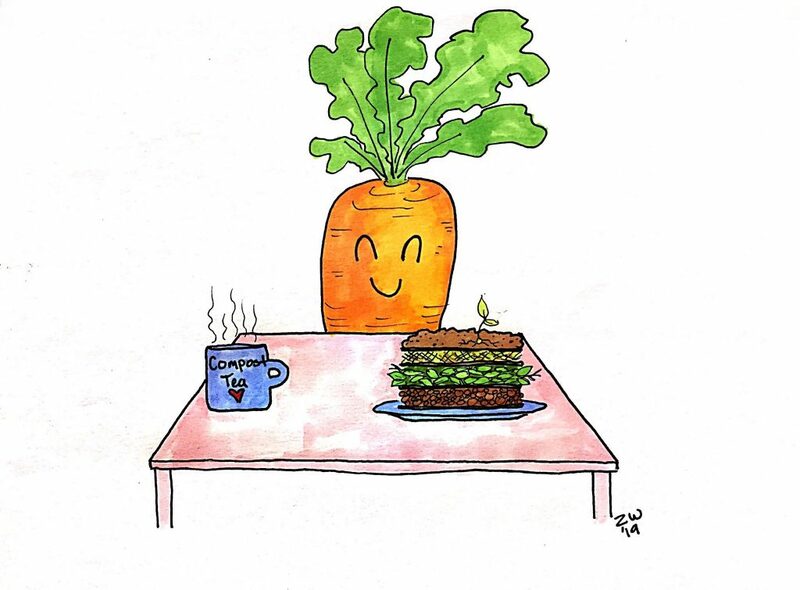 The nitrogen materials include food scraps and coffee grounds, but you may also want to consider a higher nitrogen source, especially at the bottom of the “lasagna”. If raw manure isn’t accessible, a layer of chicken manure pellets would also achieve the same effect. Another option here would be worm castings, both of which we have available for purchase. Make sure not to skip the soil amendments layer! Saving eggshells for awhile to crush and spread is a great way to add calcium. Rock dust or garden lime would also be great to add at this time as our soil is naturally acidic and this helps mitigate that. This project can be a lot of work, so its important to not bite off more than you can chew. The quality of the sheet mulch comes from getting all the pieces in place quickly, and then letting it all marinate together and break down. This is a great weekend project to tackle with a group so that you don’t get overwhelmed. And if perhaps this seems overwhelming, please keep in mind that we at Seascapes have knowledgeable designers on staff and offer garden consultations. We also sell ready to use compost for your convenience! This article was written by Alli, Kauai Seascapes Nursery employee. 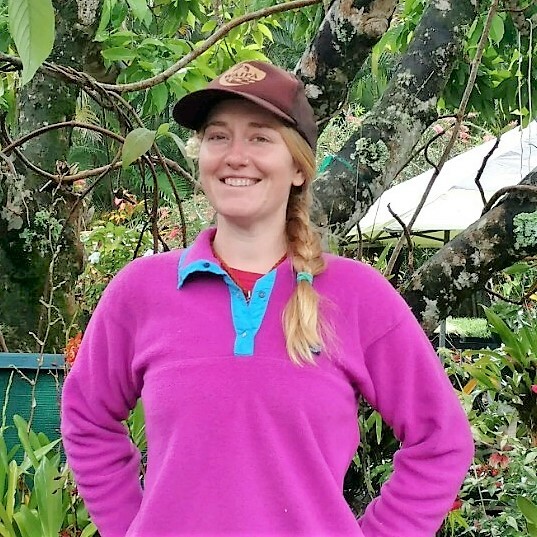 Take advantage of Alli’s knowledge on your next visit to the nursery! She knows her stuff!